AAD-05 during 7th test on February 10, 2012. 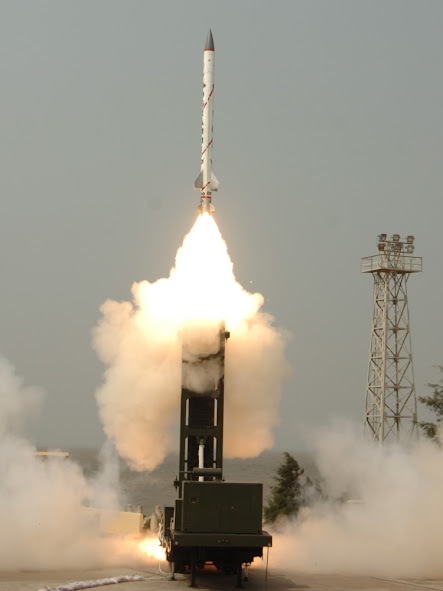 Strategic Forces Command (SFC) of the Army plans to test the Agni-1 MRBM on Friday, April 11, 2014, using a randomly selected missile from the production lot. The Agni-1 test would be followed on April 19 by a test of DRDO's Ballistic Missile System (BMD) endo-atmospheric interceptor missile. A Prithvi missile flying a trajectory similar to that of an IRBM would serve as the target. Starting April 21, Indian Army and Air Force personnel will conduct a series of 12 tests of the Akash missile. It's not clear from the report as to which BMD interceptor is to be tested - BMD Phase 1 interceptor, or the BMD Phase 2 interceptor. DRDO has carried out 8 tests of its BMD Phase 1 system so far, the last being on on November 23, 2012. During that test, the Phase-1 endo-atmospheric interceptor AAD successfully intercepted a Prithvi missile flying the trajectory of a missile with a range of 600 km to 1,000 km. In the past, DRDO has claimed that BMD Phase-1 is ready for deployment. BMD Phase-2 is designed to intercept ballistic missiles with ranges greater than 5,000 km. The Hindu reported on September 30, 2013 that DRDO has completed design of the Phase 2 interceptor missiles - AD-1 endo-atmospheric interceptor and AD-2 exo-atmospheric interceptor - and trials would be held next year.